bNeurology (K.L.F., R.G.N. ), Massachusetts General Hospital and Harvard Medical School, Boston, Massachusetts. CS system: 0 = absent collaterals >50% of an M2 territory; 1 = diminished collaterals >50% M2 territory; 2 = diminished collaterals <50% M2 territory; 3 = collaterals equal to contralateral side; 4 = increased collaterals. There is progressive decrease in admission (A) DWI lesion volumes (P < .001) and (B) NIHSS (P < .001) as CS increases. Error bars represent 95% confidence intervals. ROC curves for CS versus DWI volumes (A) >100 mL (AUC = 0.84, P < .001) and (B) >70 mL (AUC = 0.78, P < .001). 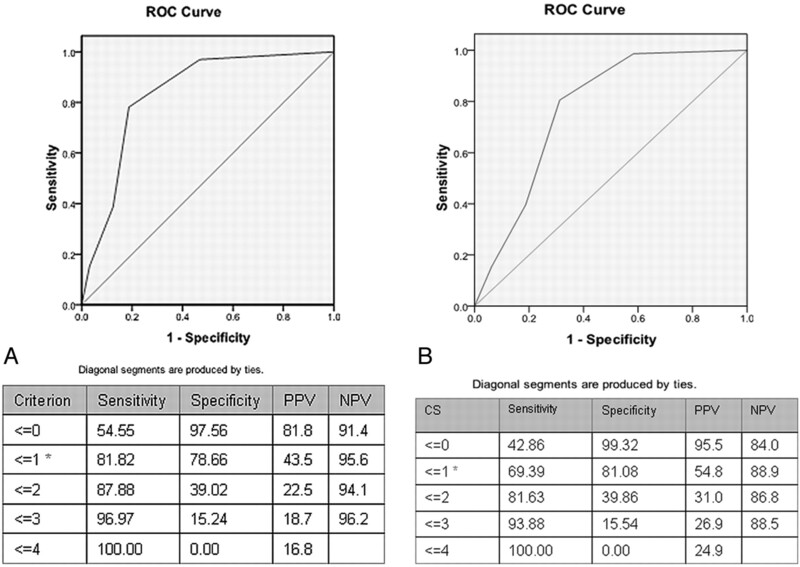 Tables display test characteristics for various scores, including optimal operating points (*), and positive (PPV) and negative predictive values (NPV). Scatterplot of DWI volumes versus CSs. Most CS = 0 patients have lesion volumes >70–100 mL (horizontal lines). There is great overlap between the other CS categories. 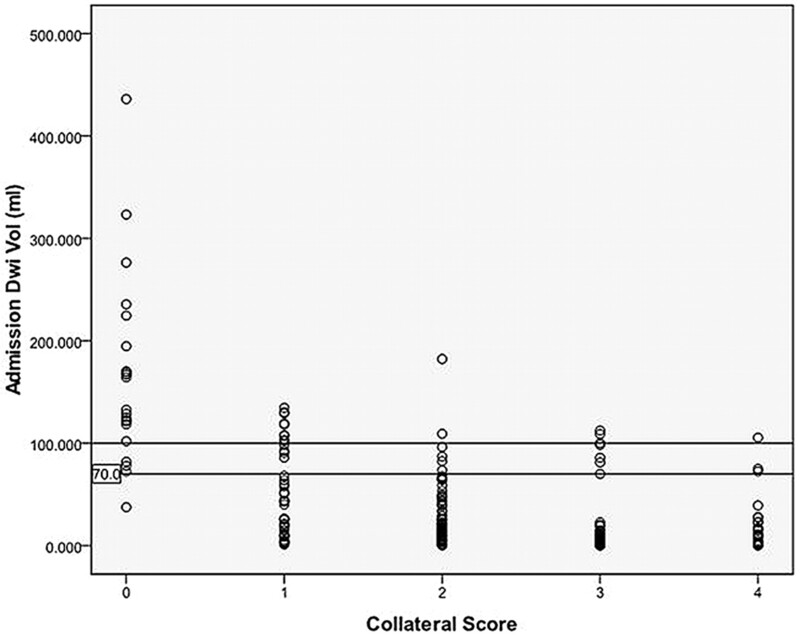 Distribution of mRS scores between patients with CS = 0 versus >0. Note:—Results are expressed in mean ± SD, median (interquartile range), or percentages. 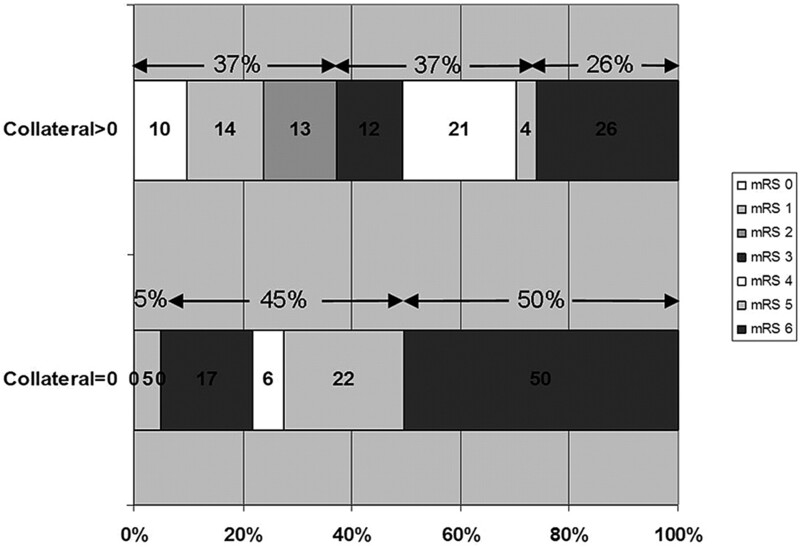 Can diffusion- and perfusion-weighted imaging alone accurately triage anterior circulation acute ischemic stroke patients to endovascular therapy? Letter by Neugebauer and Juttler Regarding Article, "Poor Collateral Circulation Assessed by Multiphase Computed Tomographic Angiography Predicts Malignant Middle Cerebral Artery Evolution After Reperfusion Therapies"